Rotel launches first DAC, plus new 15 Series preamp and power amps | What Hi-Fi? Rotel has announced four new products to join its 15 Series range of hi-fi components: the company's first dedicated DAC, a new stereo preamp, and two power amps. The new hi-fi separates aim to combine the traditional audio expertise of Rotel's two-channel products with a thorough set of features to cater for a wider-than-ever range of analogue and digital music sources. As well as the slender RDD-1580 DAC, which has twin DACs, a full suite of digital inputs and support for Bluetooth streaming, there's the RC-1570 stereo preamp (below), complete with balanced inputs, and a pair of 'little' and large power amps, the RA-1552 MkII and RA-1582 MkII. All four products use Rotel's famous Balanced Design Concept, a design ethos that has been central to Rotel's products from the beginning of the company's 50-year history. The concept takes the idea of system matching down to individual part level: choosing individual electronic components based on how they sound together, using a uniform, structured internal circuitry and reviewing changes based on critical listening tests rather than relying solely on measurements. So, to the new additions and first, the DAC. Several years in the making, the RDD-1580 is a slim, attractive box available in silver or black (as are all the new products). Inside are custom capacitors and transformers, plus two Wolfson WM8740 processors, ensuring one DAC per channel. These feed XLR (balanced) or standard RCA phono outputs. A front-mounted USB socket allows you to connect a tablet or smartphone, or fit the supplied Bluetooth transceiver to stream from any compatible Bluetooth device. Rotel says it prefers the external dongle (which is more like a bung for the USB slot rather than a USB-stick sized dongle) as putting the receiver inside the metal casing limits the wireless range of the RF Bluetooth signal. Round the back there are twin digital coaxial and digital optical inputs, and an asynchronous computer USB input capable of supporting 24-bit/192kHz high resolution audio files. The Rotel DAC is on sale now for £595. The RC-1570 preamp meanwhile replaces the RC-1560 and RC-1580, aiming to simplify and improve the 15 Series' preamp offering. There are four digital inputs, again with front and rear USB inputs, and support for 24/192 high-res audio. The analogue section has also been upgraded to allow for balanced XLR inputs. There are also four RCA phono analogue inputs, plus an MM phono stage, ensuring just about every source you can think of is supported. The new Rotel 15 Series preamp is available now, priced £795. Two hefty additions to the 15 Series come in the form of replacements for the RB-1552 and RB-1582 power amps, which we reviewed back in 2010. The MkII models have had an extensive internal reworking, added balanced XLR connections and sport dual mono block designs. The smaller RB-1552 MkII pumps out 120-watts per channel, sports class A/B amplification and the aforementioned Balanced Design Concept. Step-up to the RB-1582 MkII, Rotel's most powerful stereo amplifier, to get a whopping 200-watts of power per channel and a promised huge step up from its predecessor. There's a new toroidal transformer with twin secondary windings, for a full dual monobloc design (as on the '1552) that separates the left and right channels' circuitry and power. 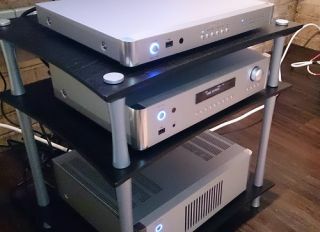 Ten Sanken transistors comprise the output stage (there are six on the smaller amp), alongside upgrades to the differential input stages, voltage amplifiers and more. Both new Rotel MkII power amps are available now and will set you back £745 and £1195 respectively. The new products join the RA-1570 amp and RCD-1570 CD player, which were launched in 2013. All four new additions to the Rotel 15 Series are available now and we'll be getting our hands on review samples imminently, so look out for our reviews.